HTC has the TouchFLO 3D, Sony Ericsson has the panels, and now Asus has Glide. So what is common? Of course, the Microsoft Windows Mobile Operating System. What is Glide you ask? 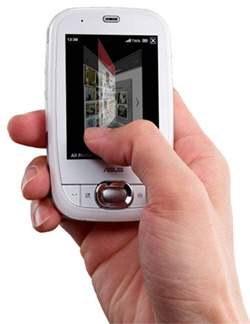 It is the Asus’ touch-responsive interface for its new smartphone, the P552w which Asus announced today. The P552w, they really need a better name for it, comes with tri-band GSM, 3.5G HSDPA connectivity, Wi-Fi GPS and seamless Google integration. This 105g smartphone has 2.8″ TFT, Touch Screen that supports 65K color, QVGA with 240 x 320 pixels. It also has a 2Mpxl camera and two new applications called the EziPhoto and EziMusic. The EziPhoto, as the name suggests is a photo organizer that you interact with just like a real album (see the photo). The EziMusic is a similar music organizer that comes with animations while playing and managing their music. It also has some thing called the ASUS SMS Location Link which is integrated with Google Maps to allow two users to find each other by sending SMS to one another. No release date or pricing has been announced.